A market research blog for Research & Marketing Strategies. Located in Syracuse (Upstate, NY). April 1, 2011 by Chris C.
A prior market research blog post (authored by our guest blogger, Mark Dengler, President of Research & Marketing Strategies) gave the following explanation of quantitative research. Quantitative research generates numerical data or data that can be converted into numbers for a statistical review. A typical example would be a restaurant survey card that asks “from 1 to 5, with one being ‘very dissatisfied’ and 5 being ‘very satisfied,’ how would you describe your dining experience today?” Ideally, quantitative research looks to obtain a statistically reliable sampling of respondents. 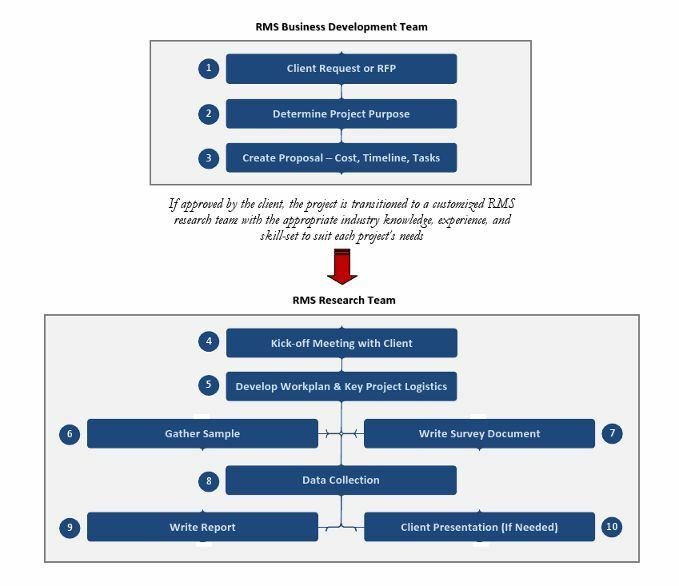 For those of you not familiar with the how Quantitative Research works on a step-by-step course, please find below a flowchart that the RMS Business Development team uses to help walk new clients through the project process. Interested in conducting a survey in Upstate, NY or other forms of quantitative research? Contact Research & Marketing Strategies (RMS) at 1-866-567-5422 or visit our website. Very good material. It is so helpful. Interested in using QualiSight for recruiting or booking the facility for a focus group? Contact our QualiSight Supervisor Lauren Krell at 315-635-9802 or by email: LaurenK@RMSresults.com.